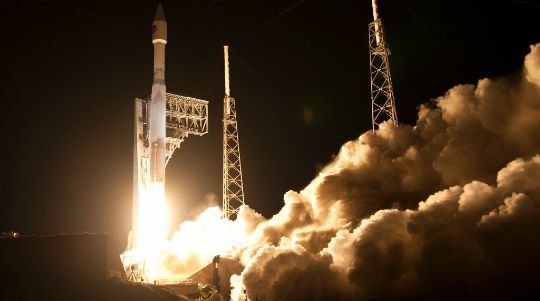 To drop itself out of the atmosphere, Cygnus lit up its BT-4 engine to slow down by a precise amount to intercept the dense layers in a planned spot over the Pacific Ocean to a) keep impact away from populated areas and shipping routes, and b) re-enter within view of the airborne observation team. 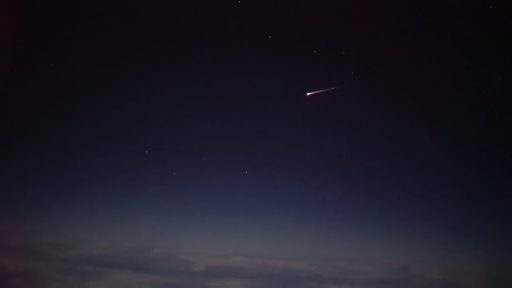 The onset of re-entry normally occurs between 120 and 100 Kilometers in altitude when the spacecraft encounters the dense layers of the atmosphere, initially not slowing down at a fast rate, but already interacting with plenty of molecules that are broken up into atoms and ions leading to plasma forming around the spacecraft which would normally become self-luminous around 104 Kilometers in altitude. Given the extremely high speed of the object, traveling 7.7 Kilometers per second at Entry Interface, air in front of the vehicle is compressed, creating a shock wave layer in which molecules are separated into ions and temperatures rise to the extreme. The Entry Point, typically defined at an altitude of 80 Kilometers, marks the beginning of of the disintegration of the spacecraft (+/-10km) due to drag building up to a destructive force, triggering the onset of fragmentation of the spacecraft structure – starting with the solar arrays ripping off and the pressure vessel breaching. 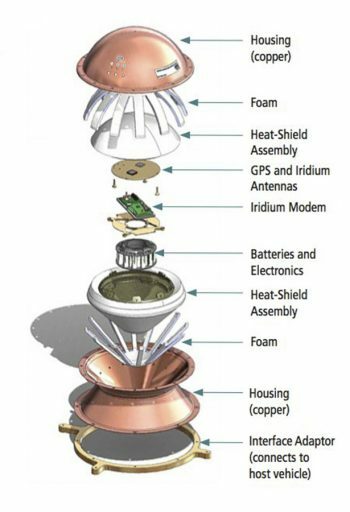 The shock wave layer forming just in front of the spacecraft and any separated components leads to considerable heating that causes the incineration of the majority of the spacecraft structure. The mechanical deceleration experienced during re-entry can be up to 20Gs, further crushing the structural components and causing the break-up of the spacecraft. Most components of the spacecraft were expected to burn up and only some fragments hit the ocean. 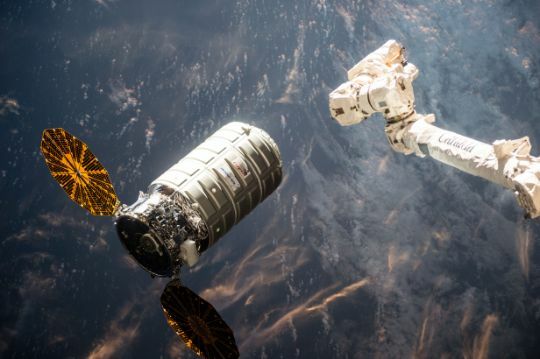 A team of 12 researchers was in place over thick cloud layer, ready to capture data during the short window of time that Cygnus broke up in the atmosphere. A chartered aircraft was outfitted with different cameras and spectral imagers to collect data on the dynamics of re-entry. 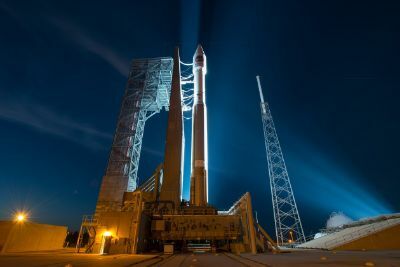 The Cygnus Shallow Re-Entry Observation Campaign was supported by the Aerospace Corporation, the FAA, NASA, ESA, the Australian Research Council and spacecraft operator Orbital ATK. Setting up a shallow entry was of particular interest to scientists as models continue to be improved for the hypersonic re-entry – either of uncontrolled satellites/debris or natural bodies. Learning about the dynamics of shallow re-entries is also relevant for the International Space Station as it ultimately approaches destructive re-entry at the end of its useful life. 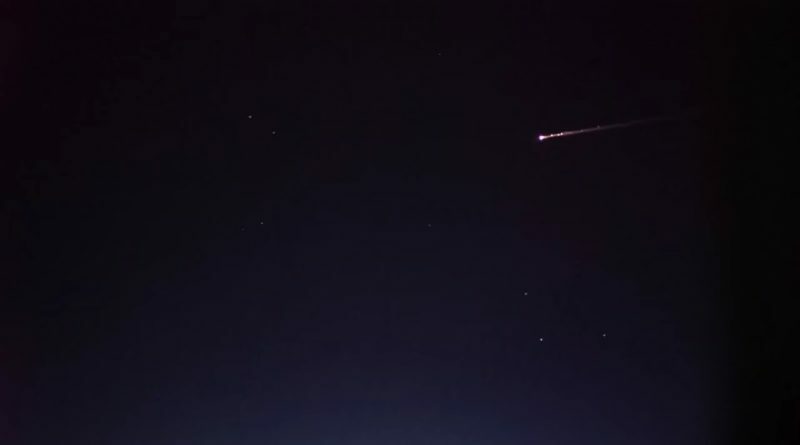 Finding a safe re-entry trajectory, i.e. entry angle, is of great importance to ensure the safety of life and property on Earth as well as other satellites in space. Due to its size, fragments of ISS could bounce off the atmosphere due to a too shallow entry and end up in various orbits, creating a debris problem depending on the energy of the objects. Creating a steep entry for ISS would require excessive propulsive power and propellant, therefore, the aim is to find an entry angle that is both, technically possible and safe for a clean end of the Station’s life. Installed inside the Cygnus was the REBR-W2, the second Re-Entry Break Up Recorder – Wireless. 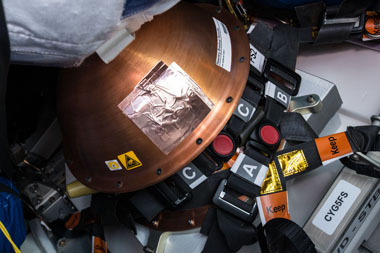 The first REBR-W found an early grave in the Cygnus Orb-3 launch failure in 2014 and the second was to be inside the ATV-5 spacecraft when re-entering the atmosphere in February 2015. 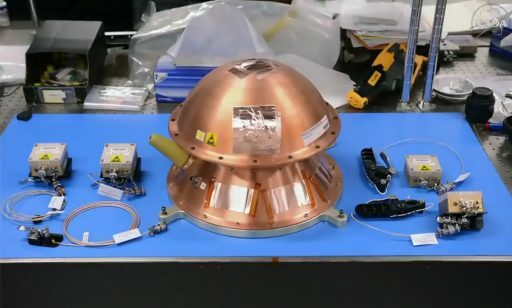 However, the planned shallow re-entry for ATV-5 had to be called off due to a technical problem on the spacecraft and REBR-W2 was kept in storage aboard ISS. Because the REBR-W2 was programmed for a shallow re-entry, its software algorithms would not be able to generate useful data in a normal steep re-entry. 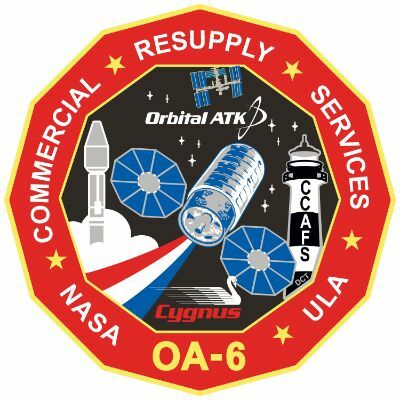 With ATV retiring, only Cygnus and HTV remained as possible hosts for REBR and Orbital ATK was very accommodating for the experiment on the OA-6 mission. Gearing up for the end of the mission, Astronaut Jeff Williams installed and activated REBR inside the spacecraft prior to departure. Unlike the original REBR that flew four missions and delivered data three times, the REBR-W can facilitate a suite of wired and wireless sensors to make multi-point observations of hull temperatures, structural frequency responses, tumble and breakup dynamics, pressure decline and speed changes. The sensors are connected to a 31-centimeter parent unit that resides within a copper housing and features a heat shield protecting all electronics during re-entry. Once the bolts holding the copper enclosure in place melt, somewhere over 50 Kilometers in altitude, REBR is liberated and continues re-entry on its own, slowing to sub-sonic speeds at which point the system will ‘phone’ up the Iridium satellite constellation via a commercial Iridium modem to send back the data collected during entry. Unfortunately, REBR-W2 never called in on Wednesday and – despite the very successful airborne campaign – no data from inside the spacecraft was collected. 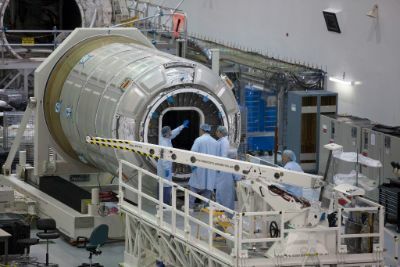 REBR developer and operator, the Aerospace Corporation, ruled out battery depletion on the unit despite the long stay on ISS of 17 months instead of the expected four weeks. However, the prolonged exposure to ionizing radiation may have damaged some electronic components on REBR as the system employs many commercial off-the-shelf components that are not radiation hardened for a long stay in space. 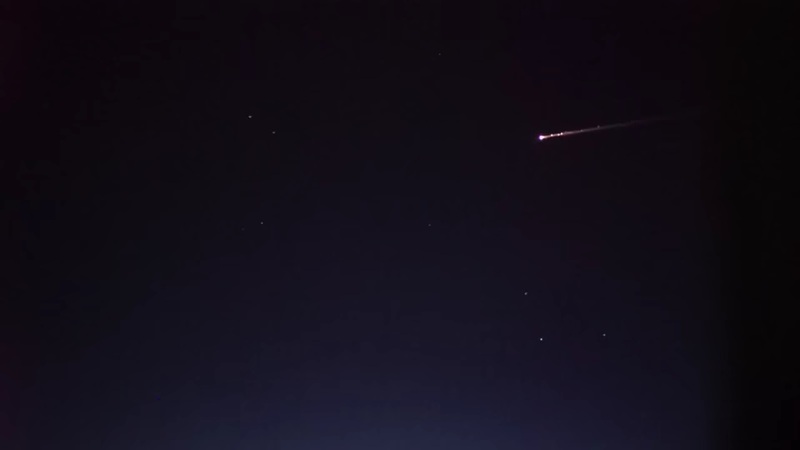 It is also possible that REBR-W2 was damaged during its risky return to Earth. 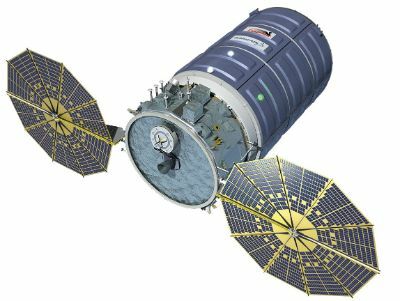 Had REBR-W2 functioned, the Cygnus re-entry would have become the most heavily studied shallow re-entry in history, but the failure of the system leaves scientists without the important data from within the spacecraft. The plan was to use data collected on the plane to characterize the readings from REBR-W2, but teams will now have to study re-entry dynamics based on the external imagery and spectral data alone. 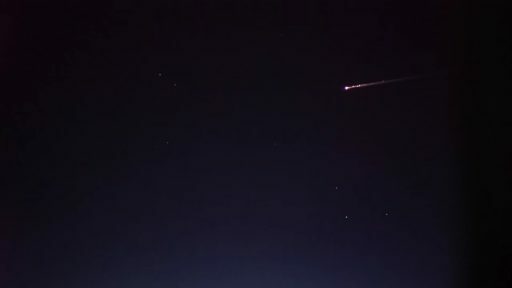 Given the desire of obtaining detailed data concerning the dynamics of re-entry, there will most likely be more flights of REBR units and observation campaigns to gather data from below. However, opportunities are few and far between as only targeted re-entries are useful for precise study.